This weekly post is a couple of days late. The WordPress app frustrates me. I tried to post this via my phone and tablet, but it just wasn’t happening. Now I’m home, typing on my familiar laptop which I missed! I spent Thursday through Saturday in Minneapolis at the AWP Conference. This is the largest conference for writers, writing professors and other professionals associated with writing and writing education. A different city hosts the conference each year, and it was nice to have it in my backyard. Seeing familiar faces. With AWP local this year, I feel I spent more time at the book fair chatting with my friends than I did browsing the tables and booths! 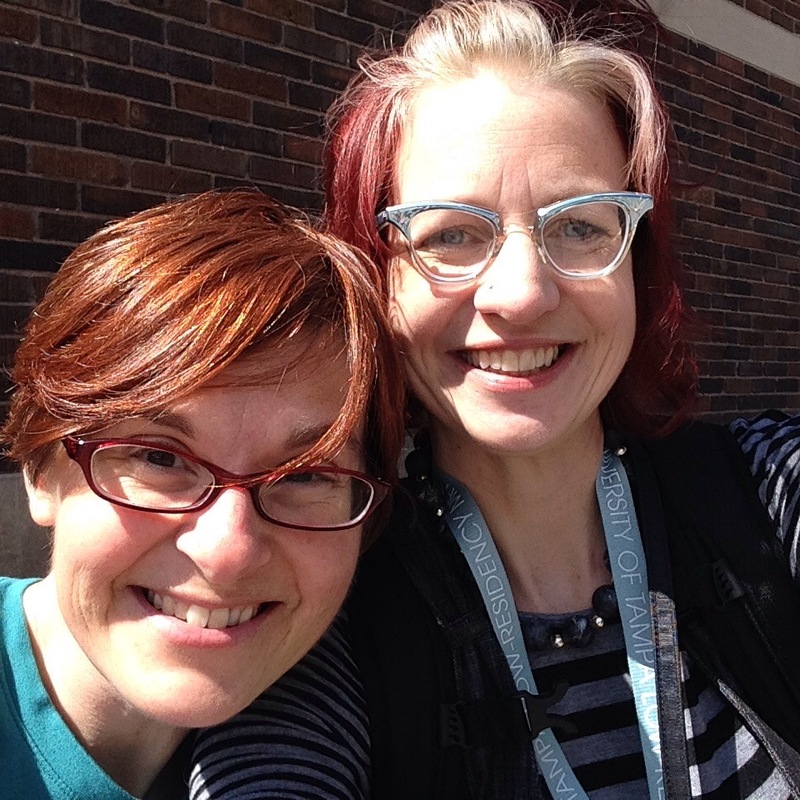 The conference offers a great way to connect with far-flung friends and acquaintances. Meeting new people. Two lovely friends invited me to social outings, and I got to meet their friends. I also did a ton of networking and introducing myself to people. And at the pub on Friday night, I spotted two other AWP loners so we all sat together. Learning new things. 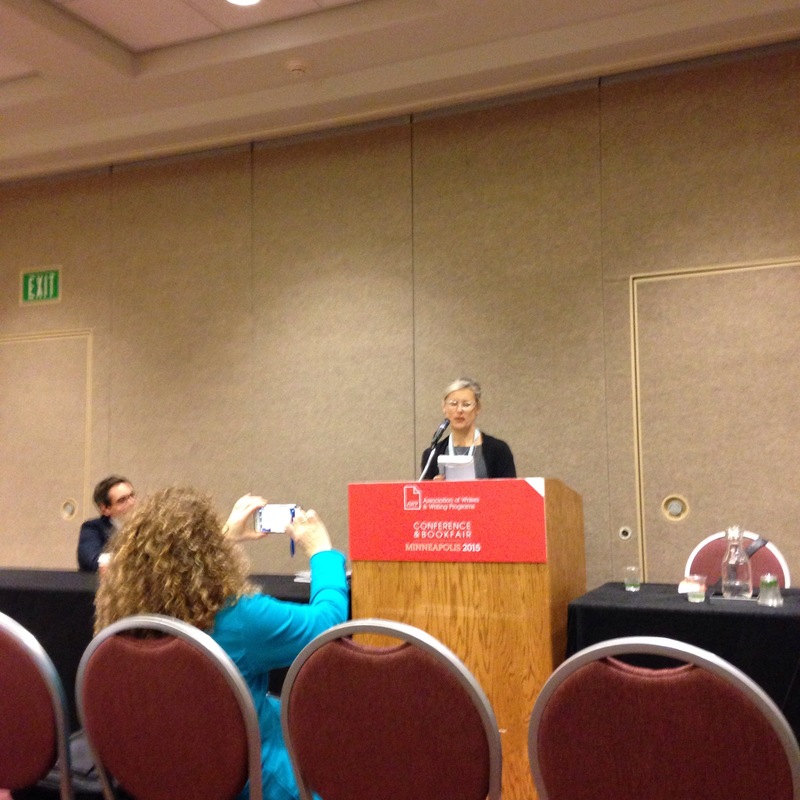 I’ve attended panels on multimedia and writing nonfiction for young adults. My mind is spinning! What might you see next from me? Perhaps a text/photo essay? Hmmmm??? If you haven’t been to AWP, I recommend it. The conference can be quite overwhelming, but I like to go into it with a specific mission. That mission might be promoting my work, seeking out lit journals in which to publish, networking, or attending panels on specific topics, such as publishing, craft, pedagogy, etc. Having a goal makes it manageable. Laurie Hertzel from the StarTribune sits in the front row and takes a picture of Sarah Stonich at the U of MN Press reading for its 90th anniversary. 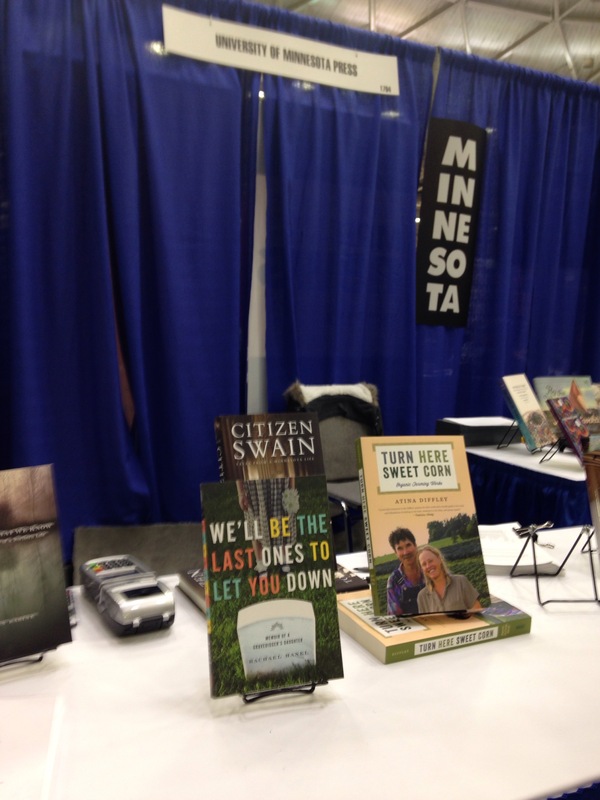 My book at the University of Minnesota Press booth. I was happy to see it here even though it’s been out for two years. I thought they might recycle it in favor of the newer titles 🙂 “Turn Here Sweet Corn” came out the year before mine. 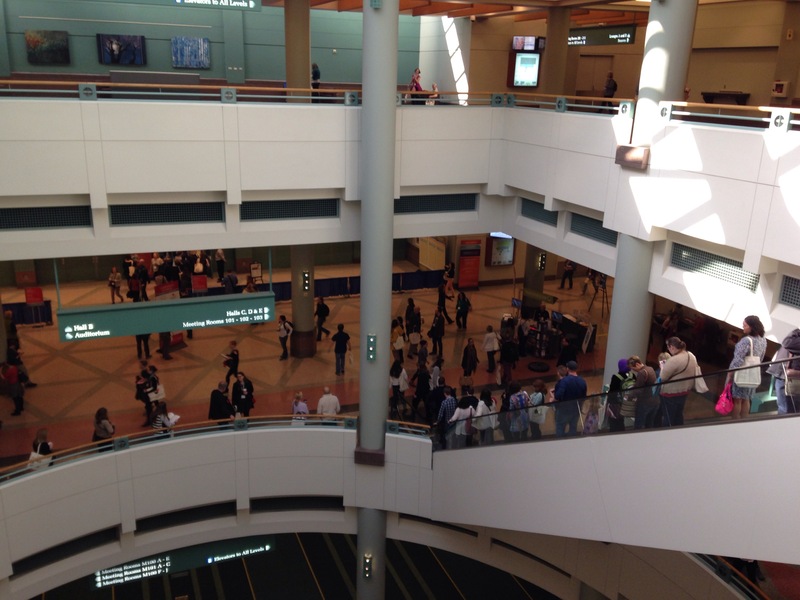 A swarm of writers at the Minneapolis Convention Center. This wasn’t even during a busy time. I want one of these! 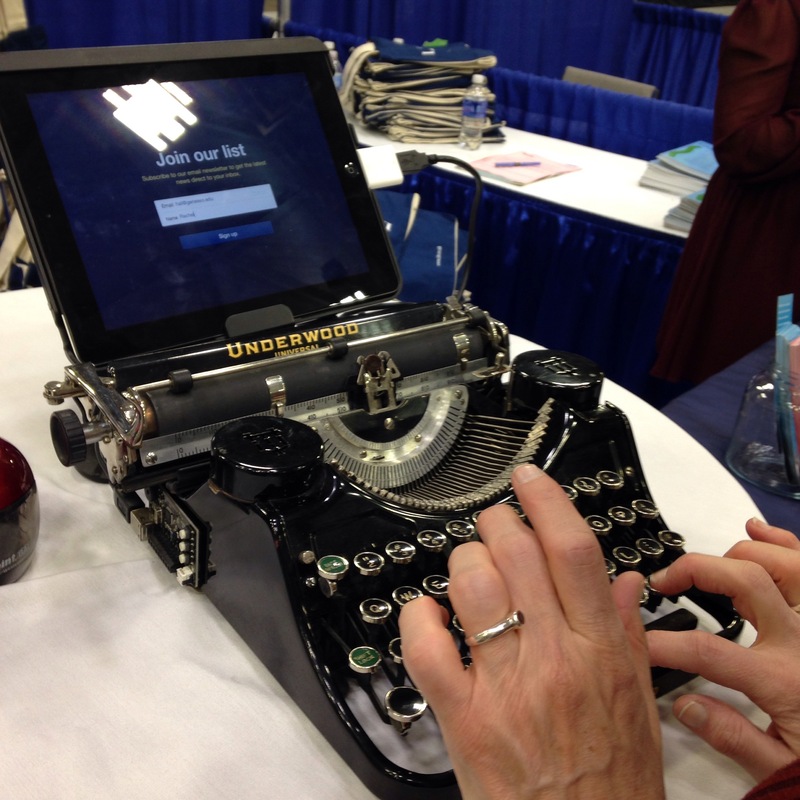 It’s a typewriter reconfigured to work with an iPad. I guess you can buy do-it-yourself kits. Maybe this is a summer project for me! Ditto for all of it, Rachael. Already looking forward to our Northfield walks.